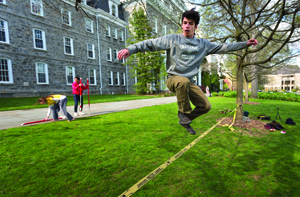 Swat Circus member Jonah Schwartz ‘15 leaps on a slack line on Parrish Lawn. Photo by Laurence Kesterson. On warm spring days, students strolling along Parrish Walk might think the “greatest show on earth” has come to campus. But the performers are not from Ringling Brothers and Barnum & Bailey. They’re Swat Circus members, gathering weekly to practice everything from juggling to balancing on a rolla bolla board. Or they could tightrope walk between two trees on Parrish Beach (newcomers needn’t worry; the cable is only a foot off the ground). Jackie Morgen ’13, who has been an aerialist since attending a circus-arts camp at age 8, founded the club in spring 2010. Since then, Morgen estimates, 40 to 50 students have tried circus arts for the first time. Alison McKinnon ’13, who joined the group her first year, speculates that “juggling has improved my hand-eye coordination and very possibly my driving.” McKinnon likes circus arts for the adrenaline and “more stunt-like” aspects. “It’s a way to exercise [as in] a theater or dance performance but more heightened,” she says. McKinnon most enjoys performing aerial feats when the group travels off campus. Once a month, clubmembers visit the Philadelphia School of Circus Arts, where they practice aerial silks, trapeze, and rope techniques, and Fly School Circus Arts, for flying-trapeze lessons. A biology major who plans to attend medical school, Morgen is also pursuing a special major in circus arts, which combines classes in dance, theater, psychology, and English. Emphasizing the academic attributes of the circus, Morgen likes to theorize about its history and therapeutic ramifications. Last summer, a grant from the Lang Center for Civic and Social Responsibility enabled her to promote the therapeutic benefits at the Circus Arts Institute in Atlanta, where she worked with children with special needs. The “personal narrative experience” that she stresses in her circus-arts practice conflicts with the common stereotype. People hear circus and think of that “three-ring, clown, and freak-show thing,” she says, but contemporary circus has actually gone mainstream in Europe, where “you send your kid to silks class the way you would ballet,” Morgen says. Though Morgen has been a circus artist for most of her life, the club welcomes every skill level. “You don’t have to have circus blood,” says Morgen, with a laugh. Morgen hopes that the club will continue after she graduates. To serve that aim, she’s leaving her “big binder of circus stuff” behind for future tightrope walkers. Fantastic!!!!! Amazing!!!!! Stupendous!!!!! and Awesome!!!! Grandma. Wonderful to learn of the open circus group. I wish we'd had such a group when I was a student.